The first unofficial Lithuanian Chess Championship was held in Kaunas (Temporary capital of Lithuania) in 1921. The Champion's title was granted after victorious or drawn match between previous champion and challenger, mostly a winner of Championship of Kaunas (later - the Championship of Lithuania) in the period from 1922 to World War II. The first official Lithuanian championship was held in 1929. 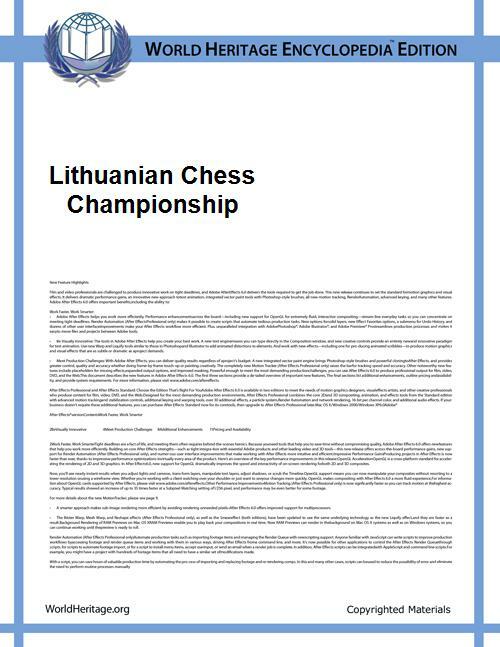 The next year, Lithuania joined FIDE, the World Chess Federation. When Lithuania was part of the Soviet Union (June 1940 – June 1941 and July 1944 – March 1990), players from other Soviet Republics were sometimes invited to play in the championship. In 1951, Ratmir Kholmov won the championship ahead of the guests Andor Lilienthal, Tigran Petrosian, and Vladimir Simagin.